So you have a bunch of dried pinto beans in your food storage...so what do you do with them? I’m always amazed at the ingenuity of my fellow bloggers. I ran across a few recipes for how to make your own refried beans today. 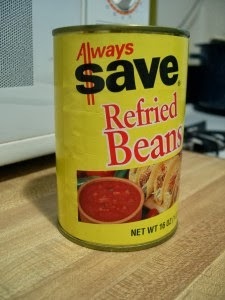 Now, I never really gave refried beans a second thought. Refried beans were, well, refried beans. They came in a can. Right? Well, as it turns out, not necessarily. You can make your own. Who knew? I suppose it would be cheaper, too, to make your own, especially if you’re like me and you buy your beans 25 or 50 pounds at a time. Then they get really, really cheap! 1. Healthier -- Canned, store bought beans are usually full of hydrogenated oils and preservatives. 3. Better tasting – To be perfectly honest, I despised refried beans for the longest time. It wasn’t until I learned how to make them myself that I discovered that I actually love them! Homemade refried beans have a much better texture and are full of flavor. Right on, MoneySavingMom. I completely agree. By the way, if you haven’t tried it, I encourage you to check out palm shorting oil. It’s very shelf-stable, and makes an excellent storage fat. I love cooking my eggs in palm oil. It’s my go-to storage fat.